Trocar site hernias are reported to occur in 0.77% to 3% of all types of laparoscopic procedures (39,40). In adults, trocar sites of <5 mm are at low risk for the development of incisional hernias. These sites are not closed in the adult, but are closed in the child. For >10 mm trocar insertion sites created by cutting bladed tipped trocars, the fascia is approximated with a single figure-of-eight absorbable suture using a Carter-Thomason cannula or other suture-assist device. Trocars should be removed under vision to identify any herniated omentum or intestine. CO2 is largely evacuated before the removal of the trocars, and the valves of the cannula are closed to prevent sucking a bowel loop, up into the wound. 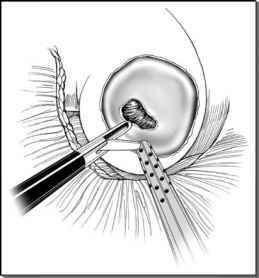 Of note, traditional bladed trocars create a fascial defect equal to the diameter of the trocar. In contrast, nonbladed dilating trocars create a defect half the diameter of the trocar. Thus, 12-mm dilating trocars should not require fascial closure because the fascial defect will only be 6-mm in size. In our experience, 12-mm dilating trocars are only closed when patients have a history of weak fascia (i.e., prior hernia), are malnourished, have been taking steroids, or have some other pathology, which can degrade the integrity of the normal fascia. With this technique, the authors have seen no hernias despite deployment of over a thousand dilating trocars. However, many surgeons, even when using nonbladed trocars, prefer to still close any midline abdominal port because it crosses no muscle. Although there are no reports in the literature, the authors are aware of a single adult case of a nonmidline trocar site herniation with a dilating trocar (41). Trocar site herniation may manifest by localized abdominal discomfort, a palpable tender or a nontender bulge at the previous trocar site, or with signs of bowel obstruction. The diagnosis is made by computed tomography scan, which will show a loop of bowel protruding through the abdominal fascia. If suspected, exploration, either laparoscopic (via an uninvolved port site) or open, should be undertaken. Usually the bowel loop can be reduced without the need for resection.